Although my entry into the world of Lexus – as vehicle owner, website editor and new model reviewer – was via the IS sport sedan line and the my.IS (née IS300.NET) fan site, I’m more familiar with the sedate, old-mannish ES than I care to admit, thanks to my father. Papi was actually an Acura fan for over a decade, starting with a 1988 Legend sedan (its first year with the larger, 2.7-liter V6) and continuing through a string of Legend and TL sedans that was broken when a 2001 2nd-generation TL suffered an all-too-common total transmission failure. 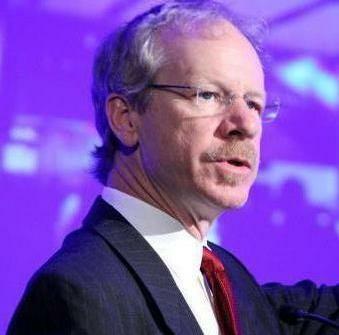 Swearing off the brand, he gave Lexus a shot. 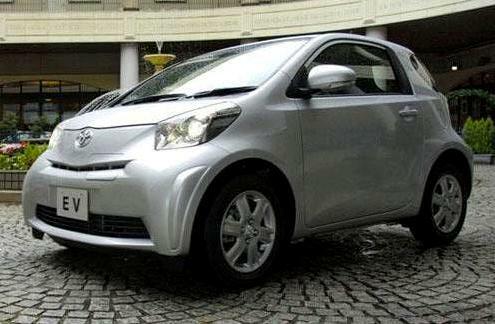 His first ES, however, was a 2004 MCV31 (4th-generation) ES 330, hardly the pinnacle of Lexus achievement. Its nose was dominated by oversized, Peugeotesque headlights, its overall looks were among the closest to its Toyota Camry progenitor, the 3MZ-FE 3.3-liter V6 felt lethargic, and the U151E 5-speed automatic transaxle’s shifts were slurry and hesitant. Sure, it was smooth and quiet, and the interior materials were top-notch, but the driving experience was numbed by a figurative overdose of Novocaine. Still, the car, and the transmission emerged from the duration of the lease in one reliable, trouble-free piece, and he anxiously awaited what the next Lexus ES would hold. Fortunately, the Lexus spirit of kaizen, or continuous improvement, was ever-present as its successor, the 5th-generation (GSV40) ES 350. Save for a noticeable but not earth-shattering downgrade in the quality of some interior materials, the new ES was a vast and noticeable improvement over its predecessor, with its exterior styling and 2GR-FE 3.5-liter V6 / U660E 6-speed automatic transaxle powertrain leading the way. The ES could now be hustled with some alacrity, helped by a “manumatic +/-” gate in the transmission shifter. Still, its moves were far from sports sedan territory. Then again, this is the beauty of Lexus’ multi-pronged entry-luxury strategy, and the reason yours truly’s daily driver is a Lexus IS. 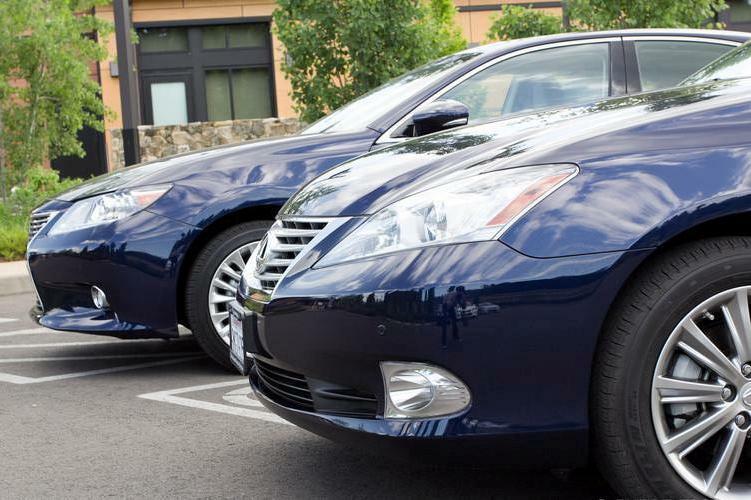 Much as the Toyota Altezza sports sedan that begat the original Lexus IS, the first ES began as something of an accidental Lexus. While kicking off Lexus’ mission of a “moon-shot”, world-class flagship V8 luxury sedan with the original LS 400, the company soon saw the need for a less expensive companion in North American showrooms. 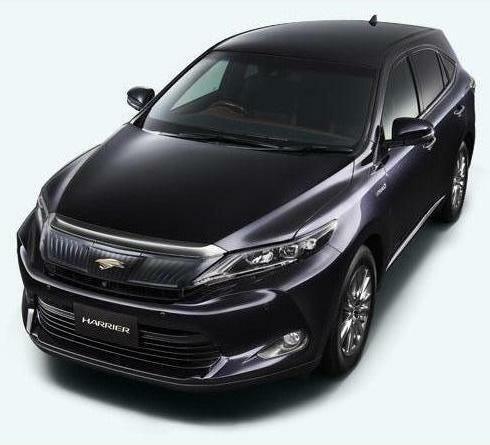 Hence, the Toyota Vista (itself a gussied-up, rebadged Camry) was hastily pressed into duty as Lexus’ original entry-level model. For the three generations after that, Toyota developed a more properly luxurious and upmarket Camry derivative, the Windom, that received Lexus ES badging for exports outside Japan. The 5th-generation, however, saw a notable change: with the launch of the Lexus brand in the Japanese Domestic Market, the company killed the Toyota Windom and saw no place for the ES in its JDM lineup. Hence, the ES became, like the original Scion tC, a Japanese-built model unavailable in its country of origin, and only offered with left-hand-drive. With the left-hand-drive-only decision also killing the ES for Australia and New Zealand, the 5th-gen ES 350 became primarily a model for North America, with a handful of Asian and Middle East sales. For the 2010 model year, however, Lexus expanded the range in China with the ES 240, powered by the 2.4-liter 2AZ-FE inline-4 engine from previous iterations of Toyota’s Camry, RAV4 and Scion tC. 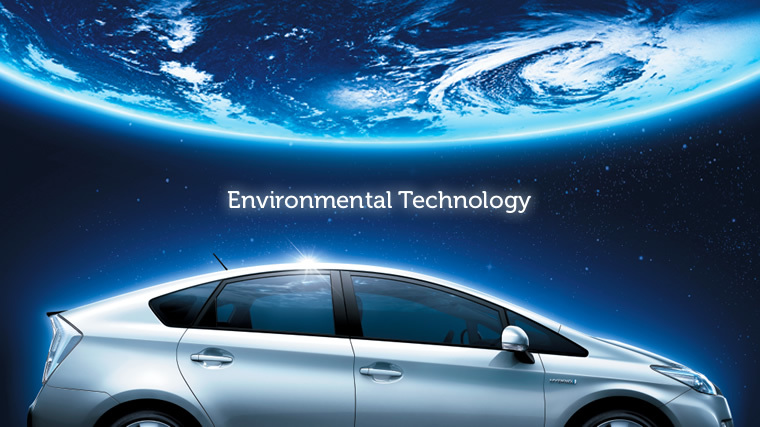 This move, aimed at countering China’s consumption tax that penalizes larger-displacement engines, succeeded beyond Lexus’ expectations and propelled the ES to 4th place in luxury sedan sales there. Thus, with the Lexus ES now the brand’s best-selling sedan line in the world’s two largest automotive markets, Chinese demands become paramount, and none is more important or significant than maximizing rear-seat legroom. To clarify that, the cheap labor that has helped put China’s booming economy on the map also means that even middle managers that can barely afford an entry-luxury import-brand sedan can nonetheless easily afford to hire a chauffeur to drive them around. This has, in turn, created a trend where local Chinese assembly operations of the German luxury 3 (Audi, BMW and Mercedes-Benz) have for years offered long-wheelbase versions of the A6, 5-Series and E-Class, respectively, variants generally unavailable outside China. And, as the trend trickles further downward, we now see Audi A4Ls and, soon, Li versions of the latest F30 (6th-gen) BMW 3-Series. Back in November 2011, at the 4th-gen Lexus GS press preview, this author asked about the possibility of a long-wheelbase GS for China, which was met with a resounding “no”. And, now, we clearly see why: in its 6th-generation, the Lexus ES is no longer Camry-sized. 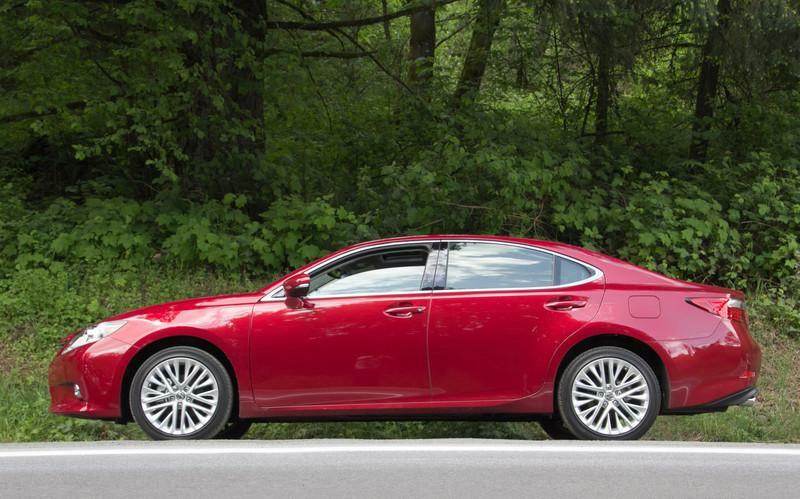 Rather, it now shares its wheelbase and underpinnings with the larger Toyota Avalon. 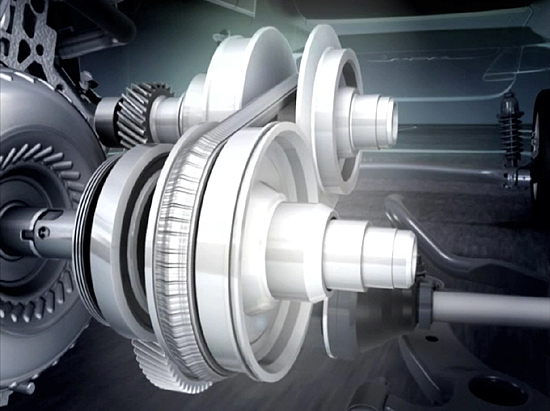 This decision strikes this author as particularly clever, since stretching a front-wheel-drive platform is easier and more cost-effective than doing so with a rear-wheel-drive one like the Lexus IS/GS uses, since there would be no need for a dedicated longer driveshaft. And, frankly, a chauffeur-driven Chinese owner could surely care less which set of wheels is propelling the car. In a marvel of space efficiency, while the wheelbase has grown 1.8″ and overall length has stretched by just 1″ versus the previous ES, rear seat head, knee and legroom have all increased, the latter by a whopping 4.1″, essentially matching the length increase of many of the Germans’ (and the Jaguar XJ’s) short-vs-long-wheelbase offerings. Does this come at the expense of front seat legroom or trunk space? Front seat legroom did see a nominal decrease (from 42.2″ to 41.9″), as did front hip room and rear shoulder room. Trunk space, on the other hand, is also larger, growing from 14.8 cubic feet in the previous 5th-gen ES to 15.2 in the new ES 350. 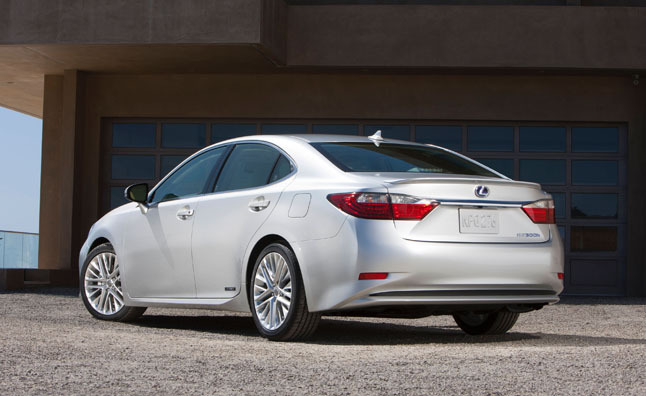 The hybrid ES 300h loses 3.1 cubic feet of trunk capacity in order to accommodate its battery pack. Overall EPA passenger volume grows from 95.4 cubic feet in the previous ES 350 to 100.1 cubic feet in the new generation, regardless of powertrain. This growth spurt, however, is not enough to push it into the admittedly arbitrary U.S. EPA Large car class, which requires a sum of Passenger + Cargo volume of 120 cubic feet or greater, a bogey the ES 350 misses by 4.7 cubic feet. 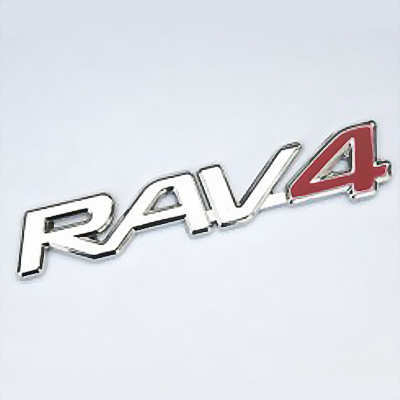 Expect the much swoopier 2013 (4th-generation) Toyota Avalon to fall out of the large car classification as well. Nor has style suffered any as a result of the China-inspired extra length. If anything, that only makes it easier to tailor a beautiful, stylish, flowing silhouette that is an evolution of the outgoing ES, with a side profile that strikes this author as the 21st-century evolution of the seminal General Motors “torpedo fastback” look typified by the 1967 Chevrolet Impala and its assorted badge-engineered siblings. 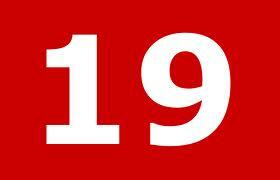 If anything prevents it from a perfect 10, it’s the hood cutline / headlight / top of grille area. Not making the hood’s leading edge match the top of the grille gives the nose something of a “snout” look that is prominent in certain angles and lighter colors. 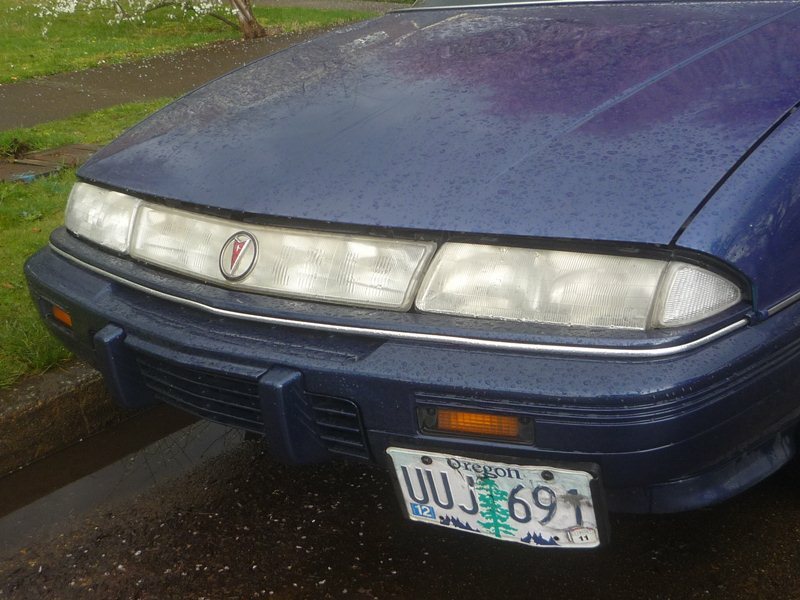 Also, the hood’s leading edge just inboard of the headlights appears to have an unduly large, unresolved gap. Finally, some simpler, less spoke-filled wheel designs might help, but this is easily solved via the aftermarket. 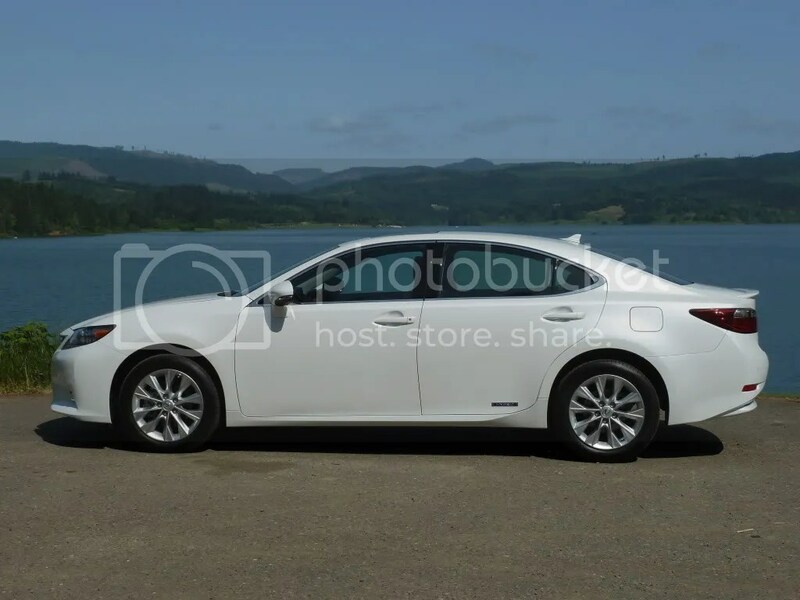 As is the case with a great majority of Toyota and Lexus models that have been renewed for 2012 and 2013, the Lexus ES 350’s powertrain (2GR-FE 3.5-liter V6 engine in its post-2011 268-hp iteration that runs on 87 octane regular fuel and U660E 6-speed automatic transaxle) carries over from the previous generation model. 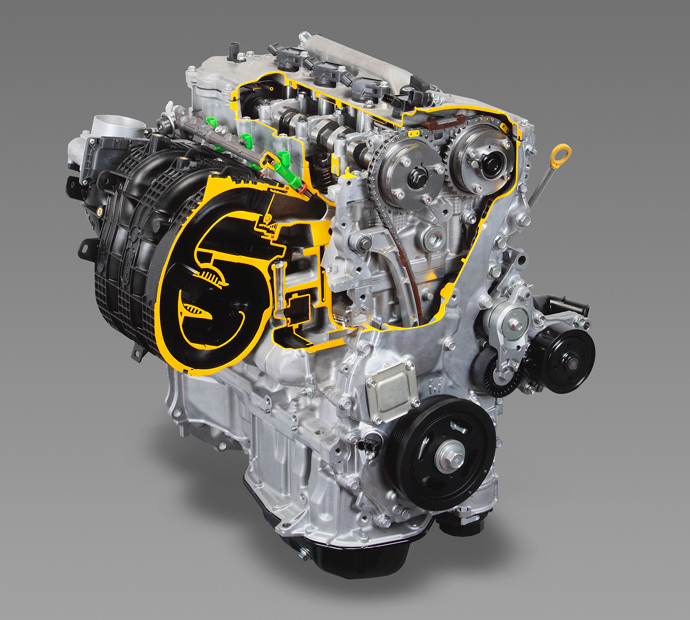 There are, however, a number of tweaks for the 6th-gen model, such as improved uphill and downhill control for the transaxle and, most importantly, a new Drive Mode Select feature with Normal, Eco and Sport (!) modes, the latter allowing for a more responsive throttle and firmer, more tactile Electric Power Steering. An improved coefficient of drag (now 0.27) and curb weight that is 31 lbs lighter than its predecessor (now 3,549 lbs) contribute towards improved U.S. EPA fuel economy numbers of 21 mpg city/31 mpg hwy (versus its predecessor’s 19 mpg city/27 hwy). Those numbers pale, however, when compared to its new ES 300h hybrid sibling’s EPA rating of 40 mpg city and 39 mpg highway. These exemplary figures, by the way, are 5 miles per gallon better than those achieved by the smaller yet 22 lbs-heavier HS 250h. Consider this yet another factor in the Lexus HS’s imminent departure from the North American market. Also notable is Lexus’ promise that the ES 300h’s hybrid price premium will be the lowest in its lineup, a distinction currently held by the RX’s $6600 price jump for its hybrid versions. Then again, this shouldn’t be all that unexpected, given that the ES 300h is down 1 liter and 2 cylinders on its ES 350 sibling. 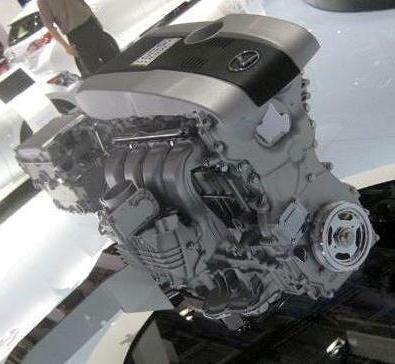 Yes, the ES 300h is powered by the 2AR-FXE 2.5-liter 4-cylinder engine and P314 Hybrid E-CVT transaxle that made their debut last year in the 2012 Toyota Camry Hybrid. Besides the notable fuel economy numbers listed above, total system horsepower jumps from 187 in its 2AZ-FXE, 2.4-liter predecessor fitted to the HS 250h to an even 200 in the new ES 300h. Drive Mode Select in the hybrid adds a fourth EV mode (allowing for up to about half a mile at speeds up to 25 mph of gasoline-free operation) to the ES’s Normal, Eco and Sport modes. Unlike the ES 350, however, Sport mode in the hybrid merely increases mid-range acceleration response and does not affect steering feel. So, how much of a hybrid price premium are we looking at for the ES 300h versus the ES 350? 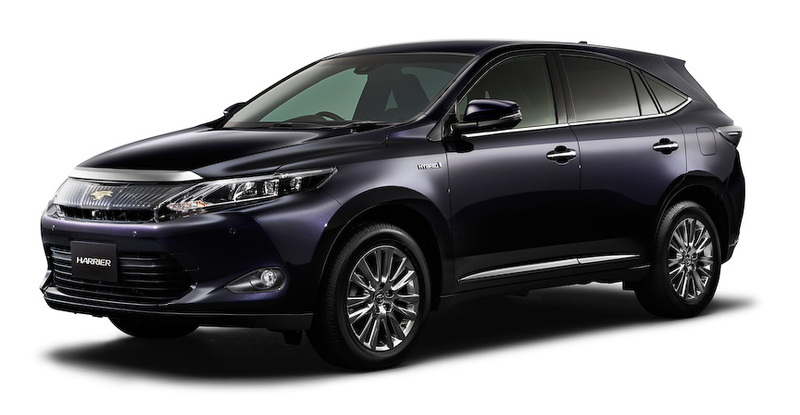 Lexus isn’t saying at this point, since pricing won’t be announced until closer to the August 2012 on-sale date. Quite notably, though, two of the Lexus ES’ Detroit-built rivals (Buick LaCrosse and Lincoln MKZ) currently offer a similar 4-cylinder hybrid (admittedly a marginal mild hybrid in the case of the Buick) or non-hybrid V6 choice with zero price difference between the two. 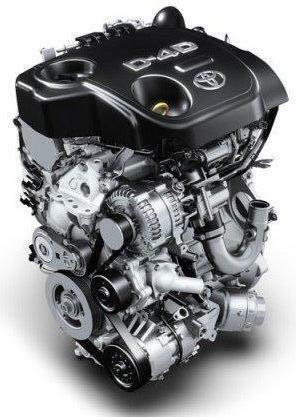 Further complicating any attempted predictions, a Toyota Camry XLE V6 at a base price of $30,115 is actually $2615 more expensive than a Camry XLE Hybrid that starts at $27,500! 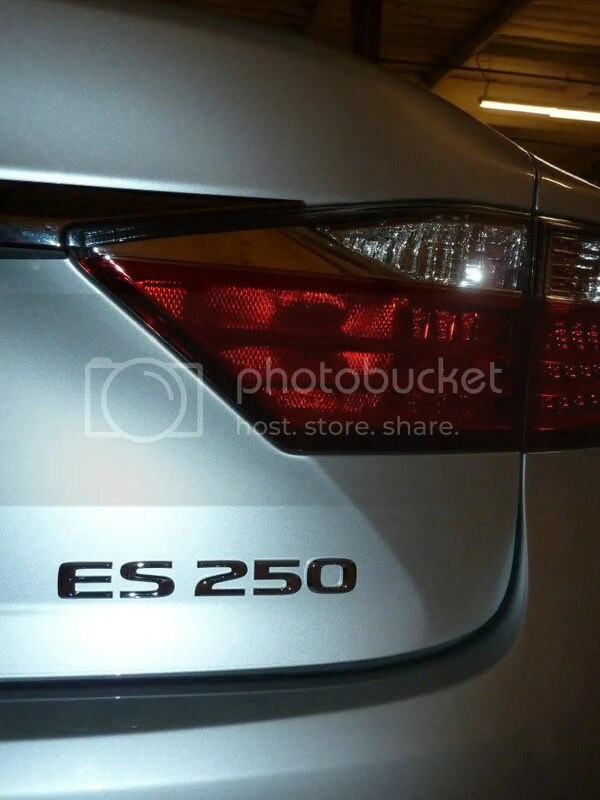 Regardless of what Lexus winds up doing price-wise, we suspect that their expectation of ES 300h comprising but 25% of 50,000-60,000 total ES sales in the United States is an overly conservative one. 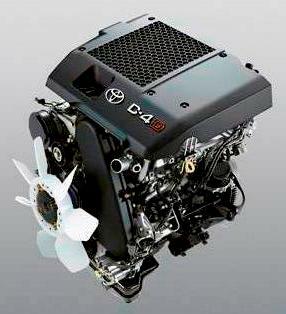 Similarly, the ES 300h engine’s non-hybrid variant, the 2AR-FE 2.5-liter 4-cylinder engine from the current Toyota Camry, RAV4 and Scion tC powers a third ES variant with a throwback nameplate: ES 250. This model, however, is currently only planned for China, where, Lexus hopes, its tailor-made cavernous rear seat legroom will help it make further inroads into the German carmakers’ dominance of this segment. …but a newfound driving enthusiasm?! All this talk of limo-like rear legroom for China runs counter to the unexpected tone taken by Lexus in the United States in anticipation of the 6th-generation of what has been the stereotypical vehicle of choice for affluent retirement communities. 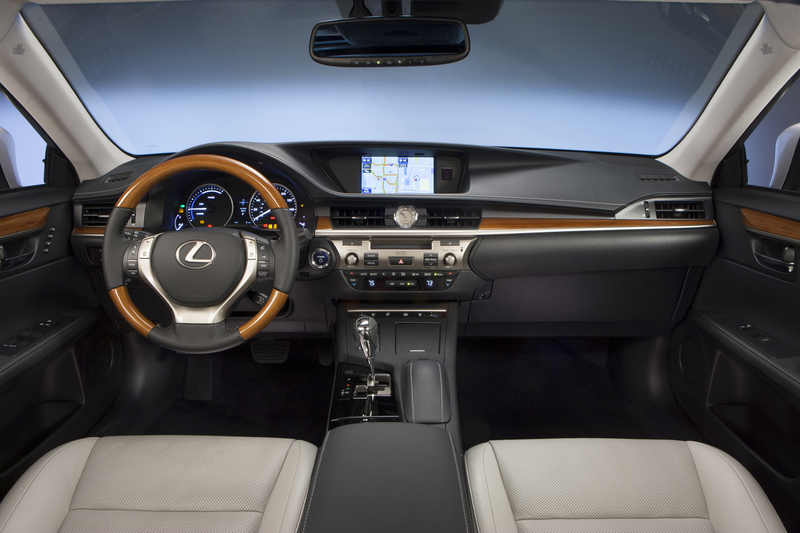 Lexus USA’s initial, late March 2012 news release mentions “a new dynamic driving experience”, and its follow-up for the 2012 New York Auto Show unveiling on Wednesday 4 April told us to expect “Improved Steering and Suspension (that) Deliver (a) Crisp, Confident Driving Experience” and “enhanced handling”. To be precise, Lexus strived for a “have your cake and eat it, too” combination of, in their words, unmatched ride comfort with confident handling performance. This has been achieved by numerous detail enhancements and tweaks such as revised rear dual-link strut suspension geometry, improved shock absorber damping characteristics and new opposite-wound coil springs for the MacPherson-strut front suspension. The Electric Power Steering, too, has seen its share of attention, now sporting a quicker ratio (changed from 16.1:1 to 14.8:1), as has enhanced body rigidity via greater use of lightweight, high tensile strength steel, added bracing (especially around the rear suspension) and additional spot welds. At a glance, the new ES has many of the next-generation interior touches that mark Lexus’ newest models, such as a hefty, small-diameter sporty steering wheel, a sweeping dashboard with accent stitching, a large, centrally-located display screen below which resides an analog clock and, on the center console, the computer mouse-like Remote Touch interface, all rendered in luxurious, high-quality materials. Someone forgot about the latter, however, when it came to that console, which is made of cheap-looking hard plastic and, surrounding the shifter gate, fragile and easily scratchable piano black. 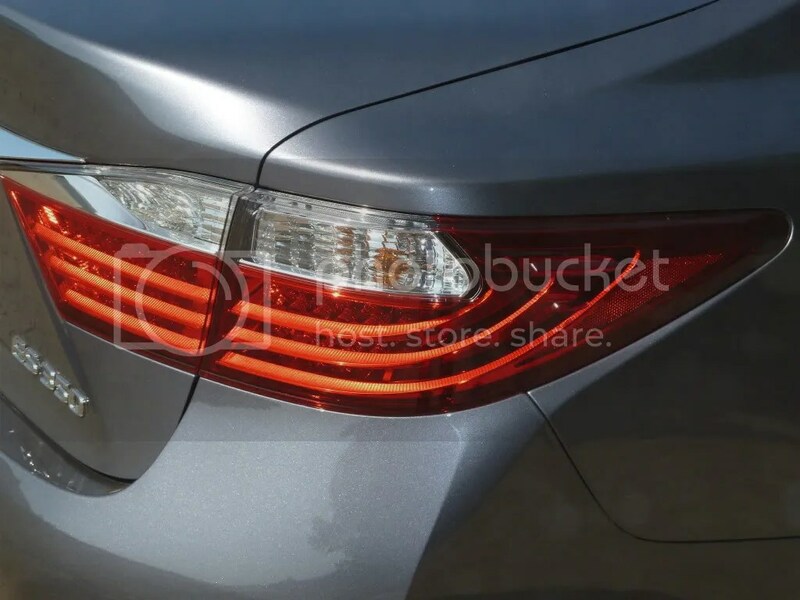 This lamentable bit of cost-cutting is also apparent, to some extent, in the latest Lexus GS. There, however, the stitched padding from the console comes down and covers much of the console sides, and the piano black around the shifter occupies a much smaller area. Here’s hoping that this unfortunate gaffe is remedied in the mid-life facelift, if not sooner. 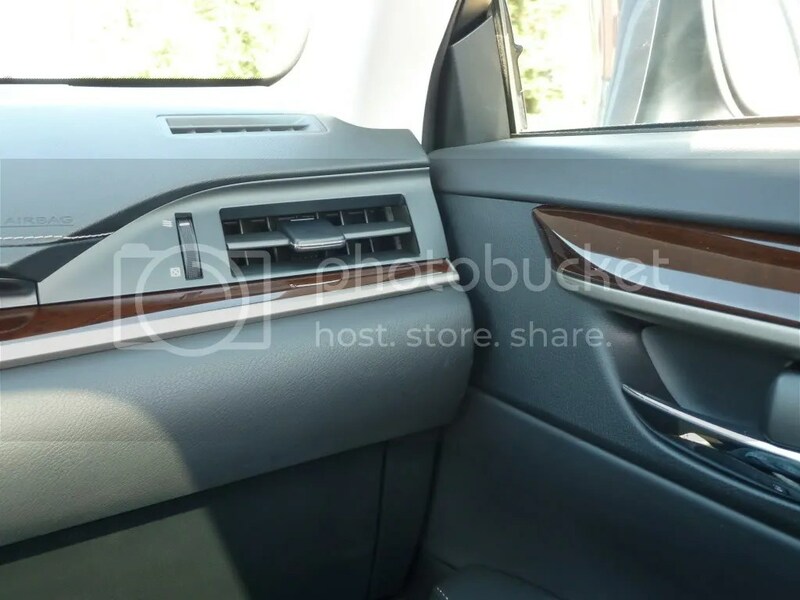 And, while we’re quibbling about the interior, given the current design trend towards a single continuous flow from dashboard to door panels, it’s jarring to see such an abrupt, mismatched and misaligned-looking transition between the two, especially in the passenger side as shown below left. As we set out in a “base” (Premium Package) Nebula Gray ES 350 with black NuLuxe (faux leather) interior, we were pleasantly surprised at the increased level of side bolstering in the front seats. Further proof of Lexus’ serious intent was the fact that, short of racetrack drives for the IS F and LFA, two of the four suggested driving routes Lexus planned in the Newberg, Oregon area for the new ES were actually twistier, more enthusiast-friendly mountain roads than anything offered up by the carmaker in previous 2nd-gen IS, IS C, HS, CT and 4th-gen GS press previews. So, did the ES 350 lurch and wallow through the twisties with a sloppy mal-de-mer ride? Hardly, and this was probably the most unexpected surprise this author has ever received at a Lexus press preview. The ES hustled and flowed with the curves, the transaxle’s manumatic gate (sorry, no paddles, though they will be offered on its Toyota Avalon sibling) a willing and responsive partner. Even the minimally-changed powertrain just felt better than in the previous ES 350, especially in the new Sport mode, and torque steer seemed better reined in. We couldn’t resist several runs through this quasi-roller coaster of a road. Our only minor quibble is that there seems to be a touch more road noise, especially from the optional 18″ wheels and tires, than we recall in the previous-gen ES. Nothing but a fleeting observation, though, compared to the quantum dynamic leap otherwise. Further proof of how lithe the new ES 350 felt was a later drive through part of the same route in the shorter yet taller Lexus RX 350 AWD F Sport, which felt far more numb and ponderous even with a purported sports suspension and two extra gears in its exclusive 8-speed U880F 8-speed automatic transaxle with paddle shifters. Taken aback by the ES 350’s newfound willingness, this author later tried the ES 300h along portions of the same route, in Sport mode no less. The hybrid powertrain, while a noticeable improvement from its predecessor in the Lexus HS 250h, is still no match in smoothness or willing get-up-and-go for its V6 non-hybrid sibling. Yet, an average of 35.4 mpg even in those un-hybrid, drive-it-like-you-stole-it conditions is nothing to sneeze at. Then, this author did penance for his decidedly ungreen driving by crawling sheepishly and silently into our resort’s parking lot in EV mode, using nary a drop of gas. 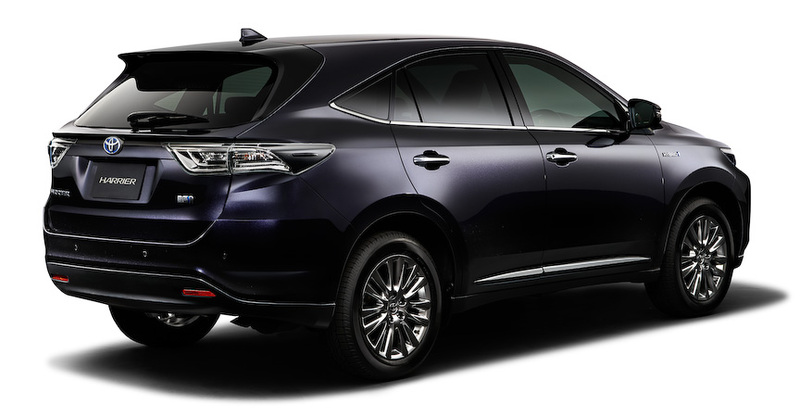 So, would this author choose a Lexus ES over a similarly largish GS or similarly-priced IS? Frankly, no, since the ES remains, ultimately, wrong-wheel-drive and less sporting and engaging than its rear-wheel-drive siblings. Still, the gap is closer than we’d ever imagined it could be, and, after noting similarly drastic improvements in the new 4th-generation GS versus its predecessor after driving both back-to-back, we’re happy to report that Toyota’s newfound commitment, from Akio Toyoda on down, to making more rewarding and involving driver’s cars is gradually but surely coming to fruition. 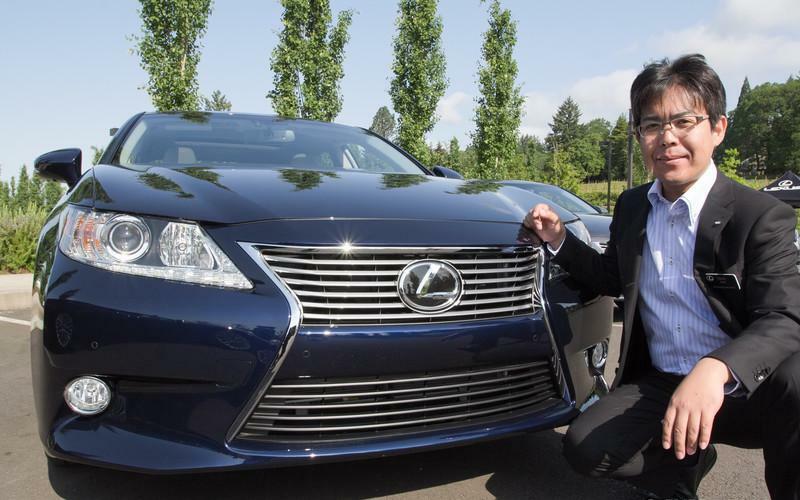 In the case of the new ES, it is chief engineer Toshio Asahi, and not Juan Ponce de León, that gave Lexus’ best-selling sedan a much-needed dip in the Fountain of Youth. More poignantly, it would’ve possibly done the same for my father. Unfortunately, at the age of 84 and with diminishing faculties, it was time for him to hang up the steering wheel, so to speak. A shame, for he would’ve surely enjoyed the best-ever Lexus ES.